high performance Minis ever since! Additional information about the BMW Mini Cooper Graphic: The début of the British-built BMW Mini Cooper took place at the Paris Motor Show in September 2000, it has now become a major commercial success. 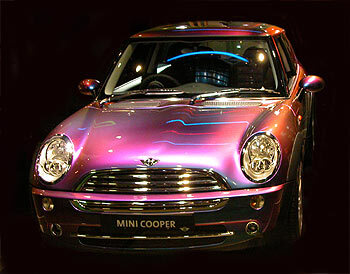 Siteseen Ltd. are the sole copyright holders of this BMW Mini Cooper picture, unless otherwise stated. We only authorise non-commercial picture use and particularly encourage their use for educational purposes. This BMW Mini Cooper picture is not in the Public Domain. 3) Use of this BMW Mini Cooper picture, or any of our pictures on websites re-distributing copyright free material is strictly prohibited.